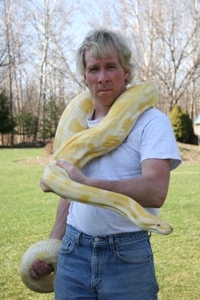 I started educating audiences about 22 years ago with the concept of providing a unique look at reptiles and helping people better understand and appreciate them. The original program featured two snakes, one turtle, two frogs and one iguana. The program idea orginated as a way to bring zoo like reptiles to children in the public schools. The goal of the show is to help children and adults understand how important reptiles, amphibians and other cold blooded creatures are to both the environment and to people who wish to keep them as pets. During my shows, the audience is able to touch and interact with the animals and learn more about them. As a kid, I used to watch Mutual of Omaha's Wild Kingdom and dreamed of someday doing my own show. Since 1988, my reptile shows have evolved with a wide variety of species of snakes, alligators, tortises, tarantulas, lizards, and giant frogs. In 2006, I was walking down the road next to my house when a car came up behind me and hit me. I was then airlifted by helicopter to Wilson Hospital. I had alot of facial damage, a broken tibia and many wounds to my arms and chest. After that day, I realized how precious time really was and wanted to spend more time with my family and friends and eventually do reptile shows full-time. Here it is four years later and my dream to do shows full-time is almost a reality. I'm at a point in my life that will allow me to do something that I have alot of passion for and that's to do shows full-time. I am very excited to be thrilling audiences for many more years to come.